In recent years most of social movements that are coming from under developed countries have protested against the new economic order called neoliberalism. They have criticized their governments and corporation that get involved in economic injustice and cultural imperialism created by globalization and its ideology. In this respect, there have been two problems, namely social economic discrepancy and cultural imperialism. In Indonesia millions labors are in struggle for the sake of the increasing minimum labor wage, health insurance, and labor rights. Most of them are hired by multinational corporates that practice outsourcing system. They demand from the Government to protect labour rights and to carry out “ekonomi kerakyatan” based on the Ideology Pancasila and the Constitution. 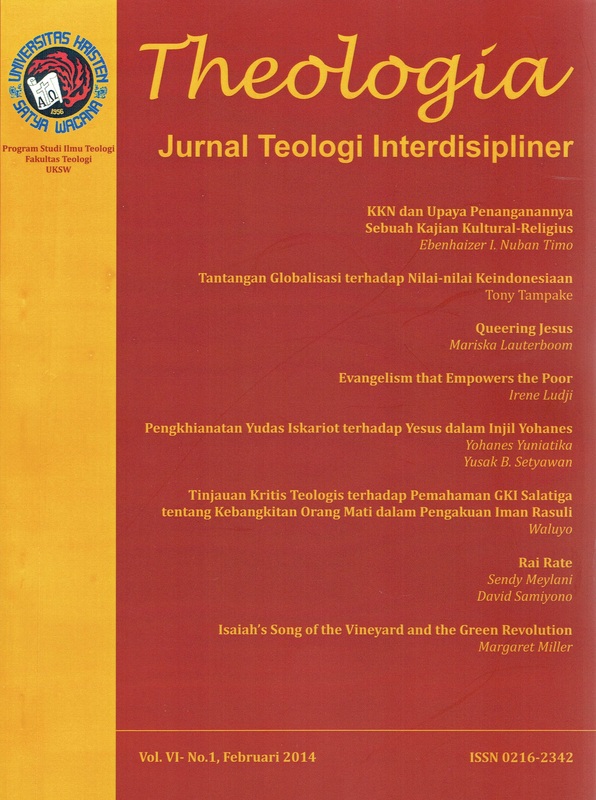 This article is concerned with the challenges of globalization in Indonesian. Economically globalization has threatened the value and the spirit of ‘gotong royong’ and resulted in social economic imbalance. Rich people have become wealthier and those who are poor become more and more poor. Socially, communal violence and conflict in the name of cultural and religious identities have emerged in communities. A number of religious movements have got involved in terrorist attacs as a way of resistance that aims to protect their identity.